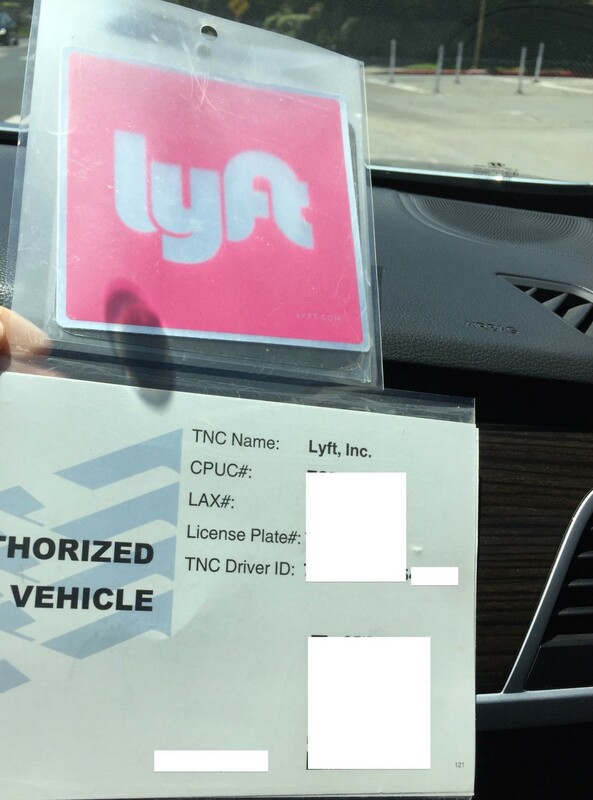 Many drivers paste both of the semi-sticky vinyl placards to their windows, but some airports, like LAX, prohibit displays of multiple TNC company trade dress at the same time so they have to be removable. Trade dress and ridehail accessories, like phone mounts, are part of how drivers for Lyft and Uber negotiate the boundaries of their public visibility, and the threat of sanctions against them. Just a few minutes before our conversation ends, Eric, a driver in Los Angeles who flips between Uber and Lyft, comments that people who are drinking will put Uber or Lyft signs in their window to signal that they are working, to avoid being pulled over by the police. They’re banking on all the anti-DUI branding Uber does to advertise that its services reduce incidents of drunk driving by providing an alternative to driving yourself home from the bar. (It might be just a rumor, but using trade dress as camouflage for drinking while driving makes sense as a way to game the system). What’s the status of this job? There are lots of reasons drivers might opt to disguise or promote their work as ridehail drivers. To help passengers locate them on a busy street, trade dress can be helpful, but not all drivers want to be identified explicitly as Uber or Lyft drivers. 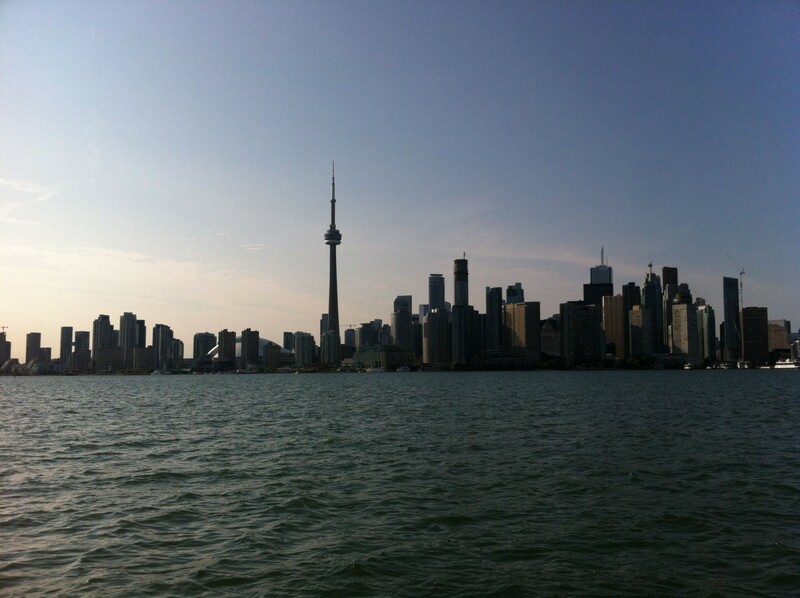 In Toronto, Farhad, a thrice-married and divorced Iranian man who looks to be in his late 50s or early 60s, drives for Uber in the evenings. He has no-one at home to take his meals with, although he let me know that two of his ex-wives keep in touch with occasional text messages, wishing him well on the holidays. Farhad’s a professional accountant at his day job. He doesn’t want tell any of his colleagues or friends that he drives for Uber, even if it’s partly for social reasons, and he doesn’t keep an Uber sign in his window. He indicates that others might think business is bad if they learn he’s driving on the side. Some drivers merely lack trade tress because the companies haven’t sent it or they’re unsure of how to get it. 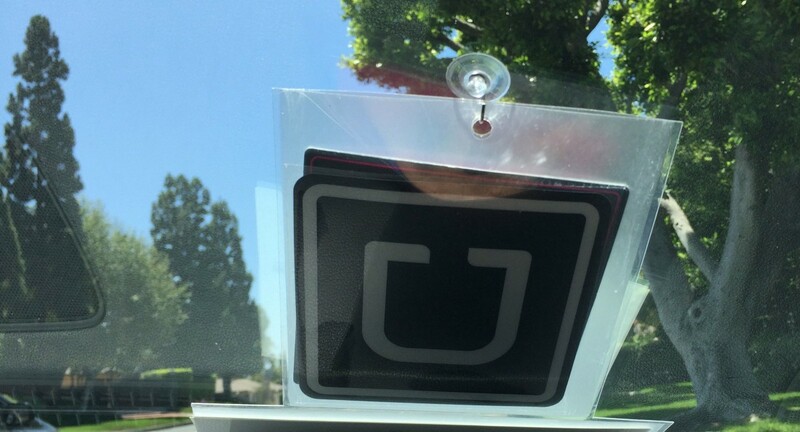 In Orlando, one driver sheepishly pulled out a Lyft placard from the pocket in his car door, saying “they sent it, but it’s small.” Uncertain trade dress habits are often part of a larger negotiation around boundaries: Uber or Lyft drivers are sometimes excluded from working in specific places, but accepted in adjacent areas. Drivers might do pick-ups and drop-offs at places where they risk fines or tickets, like certain train stations, airports, or resorts, and they use stealthy behavior to avoid detection, like hiding trade dress or calling their passengers and asking them to relocate slightly. Some drivers use TomTom or other, clunky GPS devices in addition to their phones, which can be helpful for framing the route at different zoomed in levels, or in case the phone app has a glitch. It can also act as a DECOY for drivers in hiding. 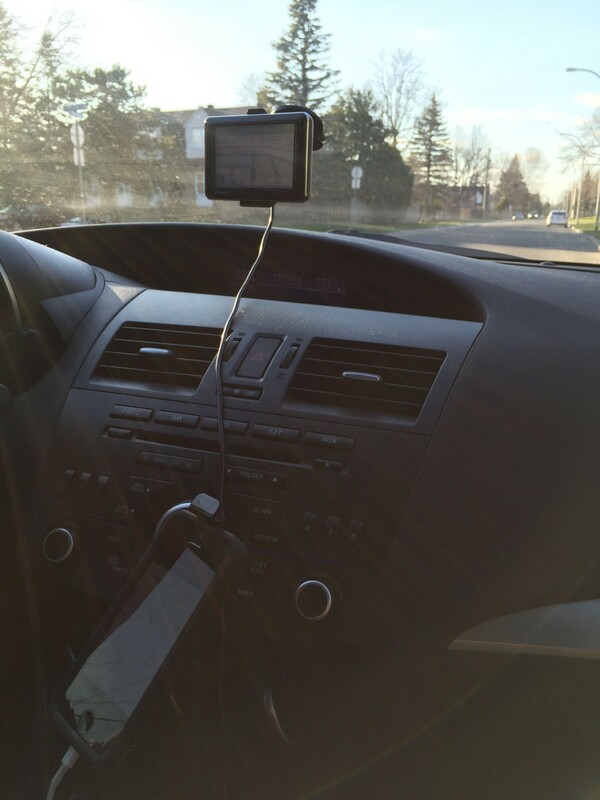 The absence or placement of phone mounts, similar to trade dress, are another indicator of how drivers negotiate the status of their job. In Montreal, where Uber is illegal and controversial, drivers learn to keep their phones hidden, either in their laps or secured to a lowered phone mount that is obscured from the probing eyes of nearby taxi drivers or transportation inspectors. (In other cities, the absence of a phone mount or trade dress can sometimes indicate that drivers are newer to the job, or do it less frequently.) No one displays trade dress in the window in Montreal. Patrice is in his late 20s and he works a few jobs besides driving for Uber to earn a living, but he beams as he talks about his primary work as a youth soccer coach. He likes the flexibility of driving for Uber because it allows him to take his girlfriend to work and pick her up when she’s done. He smiles easily, and he prides himself on his positive energy and giving a great customer service experience. To provide a smooth trip, he uses a phone mount, but when his car is at a standstill in traffic or to do a drop-off in a crowded area, he glances peripherally out his windows and checks his rear-view mirrors, and lowers his phone from view. It’s the only time I notice him looking slightly rattled during our interview. At times, the visibility of being a ridehail driver has become a contentious political issue: before Uber and Lyft closed down their operations in Austin in response to regulations, the city passed an ordinance that, amongst other things, mandate that drivers display trade dress while they’re working. (This is partly in response to an incident where a woman was sexually assaulted after she entered a vehicle she thought was her Uber (it wasn’t).